Well, today has been a very, very laggy day. I have been told that there has been massive fighting in nullsec, and according to a brief message that flashed on my screen, gates have been shut down. I’m kinda wondering if the fighters filled out CCPs new “hugeass bitchin fleet fight” form. 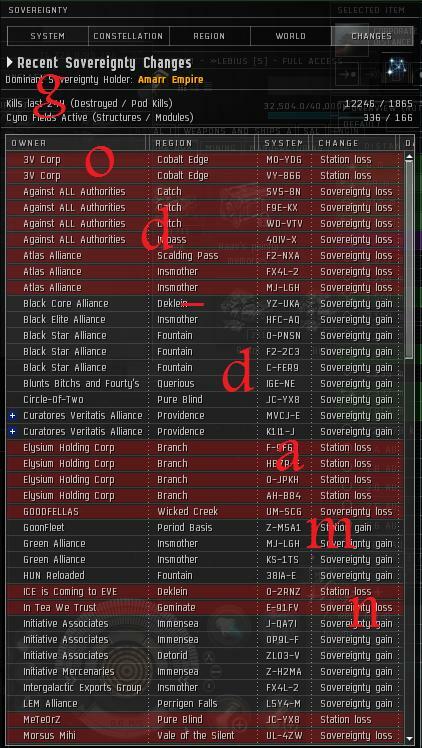 Anyway, since the nullsec before Dominion was like a bucket of squirrels fighting over a bunch of acorns, Dominion seems to have effectively covered the acorns in grease. Lots and lots of lovely fighting, and all the squirrels losing body parts which stimulates the squirrel body part market so the cyborg squirrel manufacturers can sell bionic arms to the squirrels…..
Hurray for MS paint. Anyway, All this fighting has been expected for a while now, but one thing is for certain: these warring dudes are gonna run outta ships eventually, and then the power shall return to the place it belongs: the miners! muahaha! In all seriousness, I’m a bit worried that this will only make t2 prices rise, as pvpers are gonna want ships NOW, immediately, before the dreads finish cynoing into their home base. Where Eve goes from here, no-one knows, but following chaos theory I predict AAA and goonswarm wiping each other out, being beaten to pieces by xxdeathxx, who form an alliance with atlas, while a relative unknown manages to establish a nullsec trading post and manages to keep it going by the policy of setting all station campers to red so they can’t use the station and letting everyone else come and sell/buy. And maybe, just maybe, they call the station…Milliways. Predictions/dreams aside, we had a very, very nice day in the WH and made quite a bit, top of the head calculations gives 230 mil apiece between 6 people(or however much 3.1 mil m3 of bistot goes for nowadays). One of these people is a new member in the corp, new to the WH op, so as is our custom he can’t take from the hangars and has to end and begin every sentence with the word “sir”. From a personal standpoint, I’m suspicious of every new person regardless of background, and now that I have an orca I’ve moved everything that I consider mine into a GSC, given it an eight-digit password, put it in the secure box of the orca and log off with it at a safespot, with my blockade runner and hulk inside. Trust is a very, very good thing to have. I can count the number of people I truly trust in eve on one hand, mainly because I’ve known them for over a year now. It’s my philosophy that if you can’t physically punch someone in the face, then they have no reason to not cheat you in a game about internet spaceships. P.S. hulks at 175 in Jita, what the hell? Also, I really wish I could write less time-sensitive blogs so that I could stagger them better than three in a day after 5 days of nothing, but life’s an isk spammer. I’ve got 2 more slightly less time sensative posts in drafts, and should be able to get back to a one every 2 day schedule, assuming goonswarm doesn’t dissolve in the next week or two or something amazing like that. May have to scan you down and say hello. Just remember, not all of those gains and losses are from fighting. With the change in sovereignty and its costs, many of the 0.0 alliances are either shifting powers or consolidating the systems they hold sovereignty over or even passing systems from one coalition alliance to another. Until things are really settled, you’re likely going to see a lot of systems ‘in turmoil’ on that screen. I’m a bit new ta this, is the number of ship losses/podkills usual?